Many thousands of people gathered in 436 cities around the world on the weekend to protest against Monsanto’s anti-social practices, but this was barely noticed by Australia’s media. Beekeeper Matthew Mitchell reports. 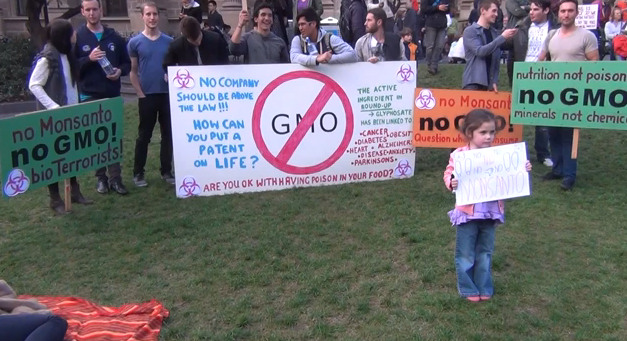 On SATURDAY 25 May, around 5,000 people protested in Melbourne as part of the global March Against Monsanto. According to a statement by an organiser in The Guardian newspaper, protests were organised in 436 cities in over 50 countries. Has anyone seen this in Australian newspapers? I was unable to find it with a search in The Age. If it was there, it certainly wasn’t prominent. Because of the dangers of neonicotinoids, the European Health Commission is instituting a 2 year ban on these chemicals, beginning on 1 December, 2013. One effect of these chemicals is that they appear to kill bees. The world’s bees (outside of Australia) are already under severe stress from varroa mites, which kills all wild colonies and allows commercial keepers to maintain theirs only with severe difficulty, usually aided by other chemicals. Bees which were being researched for resistance for Monsanto’s Roundup have been apparently illegally seized. Given the already perilous state of Australia’s wetlands, birds and ecosystems, these issues should be much higher on our political agenda and, rather than winding back our environment protections ‒ such as protecting bio-diversity ‒ we should be looking to strengthen them. Certainly Australia’s mainstream media should not be downplaying large scale efforts to draw attention to these issues, as they seem to have done with last weekend’s large-scale March Against Monsanto.